This is a national anti bullying award that many of the schools in Middlesbrough are working towards or have already achieved. Along with the award that schools and other children & young people's settings can go for you may become members and receive newsletters with all of the latest anti bullying news from DfE and Ofsted. 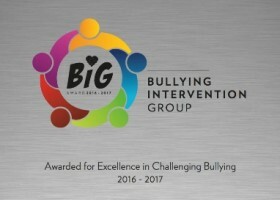 Youth clubs, childminders, sports clubs and children's homes can be members of Bullying Intervention Group and all members have access to fantastic resources and discounts too. We also have many local authorities around the UK that are members of BIG. BIG also has a library of online courses for staff to access. Member schools and organisations receive support with their anti bullying policy, strategy and receive a free survey to run with their children and young people to measure a baseline of how the school or service deals with bullying. the survey can then be repeated to measure any success or areas of improvement required. Recently we have launched our BIG Audit for schools and settings which includes the whole community and comes with an analysis and development plan. New to BIG is our online reporting tool SOS (Speak Out Safely) which allows children and young people to report bullying online via a button on your own website. Uk wide service via website. Costs are dependent on the size of your school or organisation. For example a primary school of 500 pupils or less can register for the year for £165.